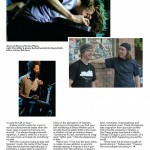 This article by Robert Loerzel originally appeared in Signal to Noise magazine’s fall 2007 issue. As a steady hum rose from the ten musicians in the loose ensemble known as DRMWPN, a flickering glow filled Chicago’s Empty Bottle. The “Dreamachine” was on. Invented in 1959 by artist Brion Gysin and scientist Ian Sommerville, the Dreamachine is designed to put your brain in a special place. It’s little more than a paper cylinder with holes cut in it, rotating on a 78-rpm record-player motor. There’s a bulb inside, and when the light filters out through those spinning holes, your brain’s alpha waves supposedly get in synch with the flicker. When you’re in the presence of the Dreamachine, you might see “powerfully dramatic scenes like brightly colored dreams” or “living fireballs like the mandalas of Eastern mysticism.” At least, that’s what William S. Burroughs claimed. 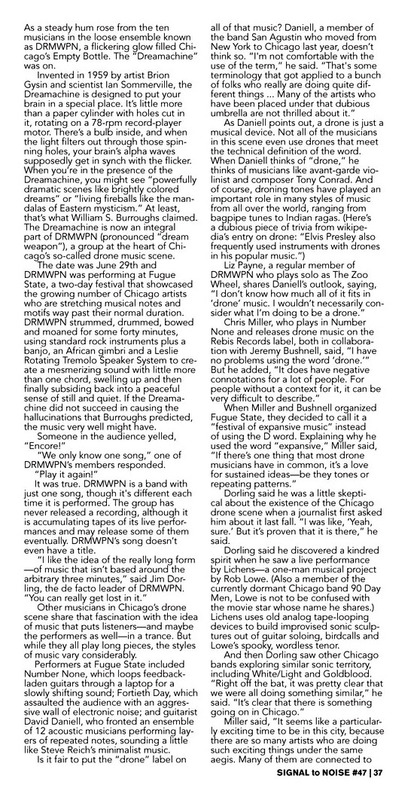 The Dreamachine is now an integral part of DRMWPN (pronounced “dream weapon”), a group at the heart of Chicago’s so-called drone music scene. 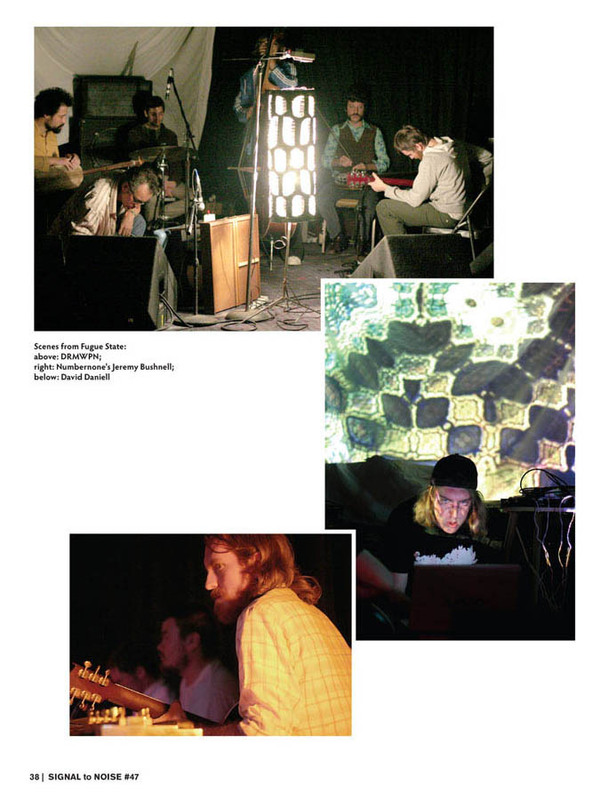 The date was June 29th and DRMWPN was performing at Fugue State, a two-day festival that showcased the growing number of Chicago artists who are stretching musical notes and motifs way past their normal duration. DRMWPN strummed, drummed, bowed and moaned for some forty minutes, using standard rock instruments plus a banjo, an African gimbri and a Leslie Rotating Tremolo Speaker System to create a mesmerizing sound with little more than one chord, swelling up and then finally subsiding back into a peaceful sense of still and quiet. If the Dreamachine did not succeed in causing the hallucinations that Burroughs predicted, the music very well might have. “We only know one song,” one of DRMWPN’s members responded. It was true. DRMWPN is a band with just one song, though it’s different each time it is performed. The group has never released a recording, although it is accumulating tapes of its live performances and may release some of them eventually. DRMWPN’s song doesn’t even have a title. Other musicians in Chicago’s drone scene share that fascination with the idea of music that puts listeners—and maybe the performers as well—in a trance. But while they all play long pieces, the styles of music vary considerably. Performers at Fugue State included Number None, which loops feedback-laden guitars through a laptop for a slowly shifting sound; Fortieth Day, which assaulted the audience with an aggressive wall of electronic noise; and guitarist David Daniell, who fronted an ensemble of 12 acoustic musicians performing layers of repeated notes, sounding a little like Steve Reich’s minimalist music. 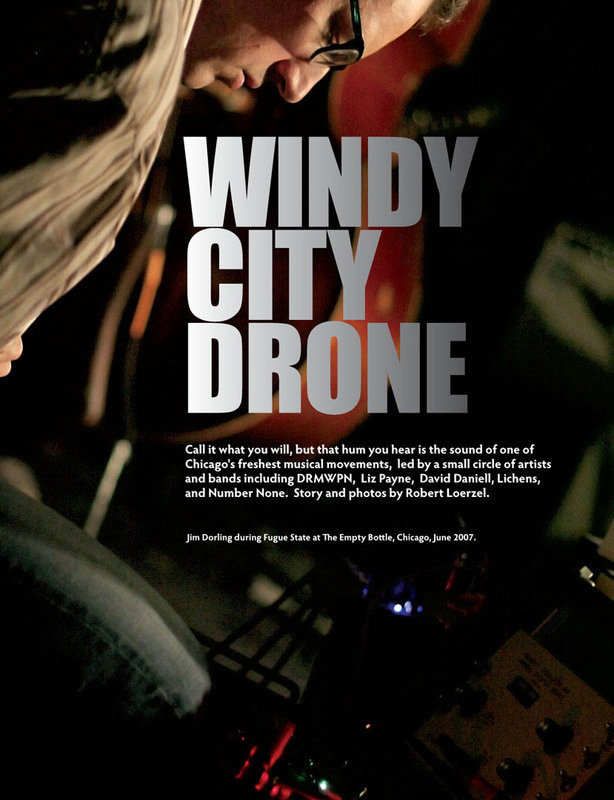 Dorling said he was a little skeptical about the existence of the Chicago drone scene when a journalist first asked him about it last fall. “I was like, ‘Yeah, sure.’ But it’s proven that it is there,” he said. Dorling said he discovered a kindred spirit when he saw a live performance by Lichens—a one-man musical project by Rob Lowe. (Also a member of the currently dormant Chicago band 90 Day Men, Lowe is not to be confused with the movie star whose name he shares.) Lichens uses old analog tape-looping devices to build improvised sonic sculptures out of guitar soloing, birdcalls and Lowe’s spooky, wordless tenor. That sense of collaboration is what attracted Daniell to Chicago. He originally planned to spend the summer of 2006 in Chicago while he took pedal-steel guitar lessons from virtuoso Ken Champion, but then he decided to stay, and now he’s teaming up with numerous local rock, jazz and experimental musicians. One of his upcoming projects is a duo with Doug McCombs of Tortoise, Brokeback and Eleventh Dream Day. 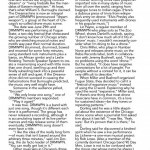 “As far as my experience goes, it’s the only major metropolitan area in the U.S. where you can really have a viable chance at making creative music as well as afford to live,” Dorling said. “New York does have a great music scene, but I’ve definitely felt more camaraderie here in Chicago… It’s been really amazing and refreshing for me to see people in the free jazz scene and the noise scene and the experimental electronic scene, all sharing band members. 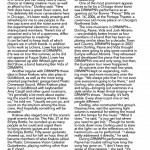 There’s lots of crossover and a lot of a openness, different approaches to creativity.” It can be hard to keep track of which players are in which bands. In addition to his work as Lichens, Lowe has become an occasional member of DRMWPN. (He was on tour this summer, so he did not appear at Fugue State.) 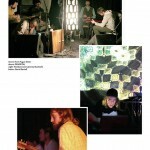 Lowe has also teamed up with White/Light and Bird Show, a band featuring Ben Vida of DRMWPN. Krakow also staged one of the scene’s signal events thus far. This Feb. 27 at the Empty Bottle, he rounded up as many people as he could and urged them to bring electric guitars and amps to the Empty Bottle. Fifty-seven guitarists showed up, and for half an hour, they all became members of what Krakow called the Plastic Crimewave Vision Celestial Guitarkestra, playing nothing other than an E chord. “I had friends who said E is the closest chord to ‘Om,’” Krakow said. “It’s kind of magical chord … I loosely conducted. I wanted it to have a crescendo. I wanted to have as much dynamics as possible.” Some of the untrained performers protested that they didn’t even know how to play guitar, but Krakow gave them a quick lesson on how to form an E chord. “I just wanted to create a huge sound and raise energy from all these people, get everyone ecstatic and lifted up,” explained Krakow. “It seemed like it worked. People went really crazy. People puked and bled and kicked each other. Krakow later staged another Guitarkestra show at the Hyde Park Art Center, though the turnout was smaller. With about 30 guitarists, the din was not quite so deafening. 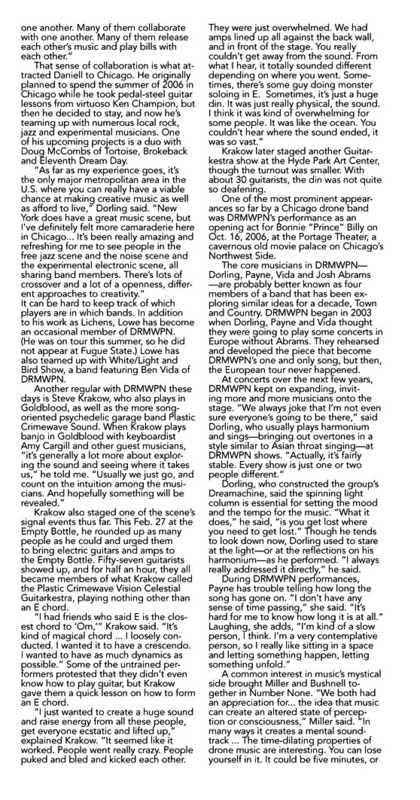 One of the most prominent appearances so far by a Chicago drone band was DRMWPN’s performance as an opening act for Bonnie “Prince” Billy on Oct. 16, 2006, at the Portage Theater, a cavernous old movie palace on Chicago’s Northwest Side. The core musicians in DRMWPN—Dorling, Payne, Vida and Josh Abrams—are probably better known as four members of a band that has been exploring similar ideas for a decade, Town and Country. 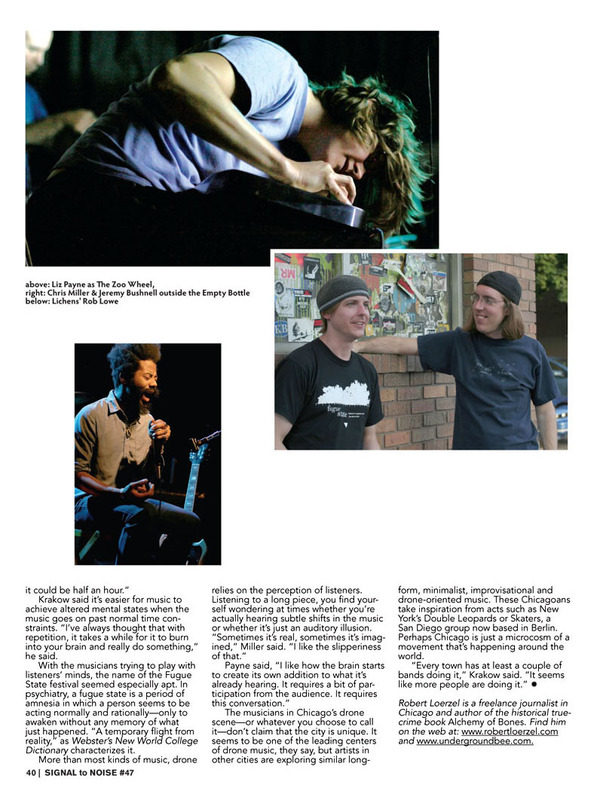 DRMWPN began in 2003 when Dorling, Payne and Vida thought they were going to play some concerts in Europe without Abrams. They rehearsed and developed the piece that become DRMWPN’s one and only song, but then, the European tour never happened. Dorling, who constructed the group’s Dreamachine, said the spinning light column is essential for setting the mood and the tempo for the music. “What it does,” he said, “is you get lost where you need to get lost.” Though he tends to look down now, Dorling used to stare at the light—or at the reflections on his harmonium—as he performed. “I always really addressed it directly,” he said. A common interest in music’s mystical side brought Miller and Bushnell together in Number None. “We both had an appreciation for … the idea that music can create an altered state of perception or consciousness,” Miller said. “In many ways it creates a mental soundtrack … The time-dilating properties of drone music are interesting. You can lose yourself in it. It could be five minutes, or it could be half an hour.” Krakow said it’s easier for music to achieve altered mental states when the music goes on past normal time constraints. “I’ve always thought that with repetition, it takes a while for it to burn into your brain and really do something,” he said. With the musicians trying to play with listeners’ minds, the name of the Fugue State festival seemed especially apt. In psychiatry, a fugue state is a period of amnesia in which a person seems to be acting normally and rationally—only to awaken without any memory of what just happened. “A temporary flight from reality,” as Webster’s New World College Dictionary characterizes it. 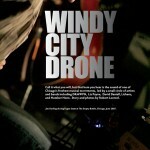 The musicians in Chicago’s drone scene—or whatever you choose to call it—don’t claim that the city is unique. It seems to be one of the leading centers of drone music, they say, but artists in other cities are exploring similar long-form, minimalist, improvisational and drone-oriented music. These Chicagoans take inspiration from acts such as New York’s Double Leopards or Skaters, a San Diego group now based in Berlin. Perhaps Chicago is just a microcosm of a movement that’s happening around the world.